I have a fun Halloween project I am going to share with you today that I am pulling out of the archives for Throwback Thursday. 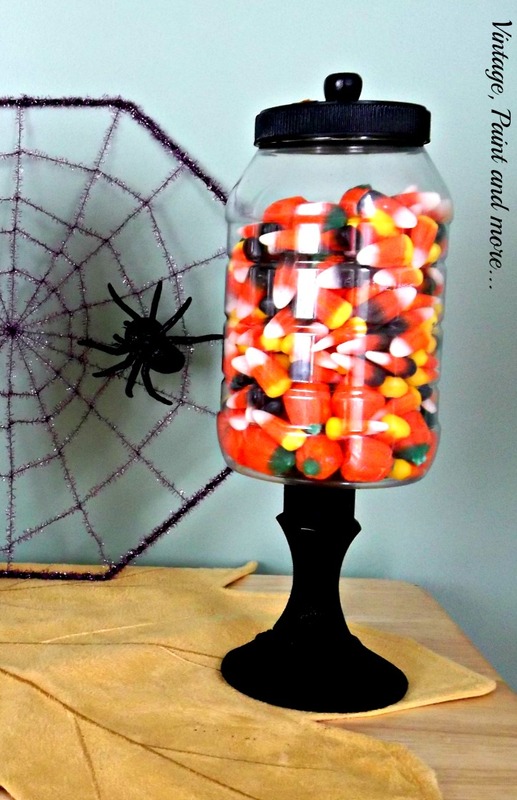 I don't do too much Halloween decorating these days like I did when my boys were young but this project is so simple and so cute - you can make it in an afternoon. Aren't they the cutest - little candy jars for all that candy corn and gory stuff kids like to eat. I had all the parts on hand so these cost me nothing to make. I used some recycled jars, dollar store candlesticks and some miniature candle holders you can buy at any craft store for pennies. 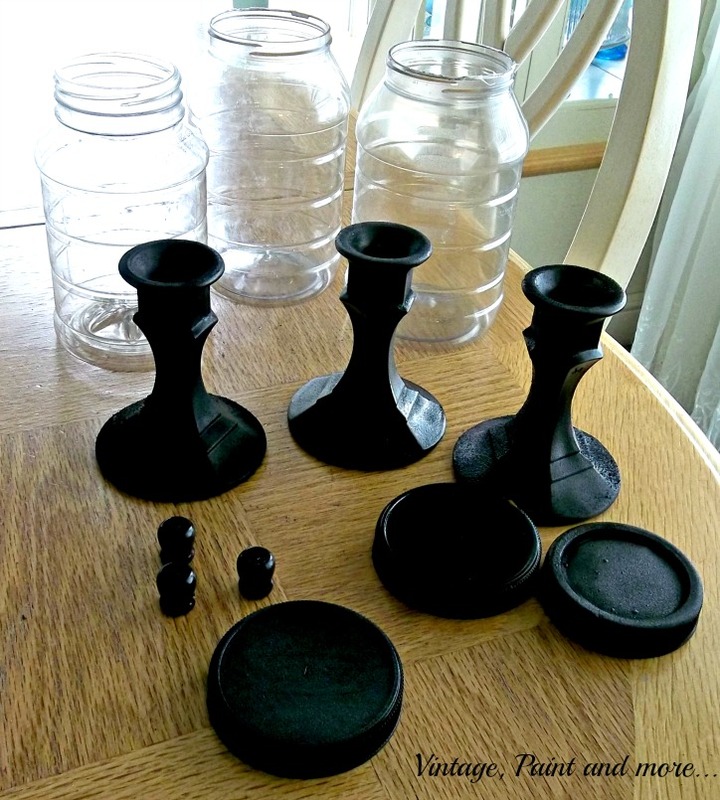 I spray painted all the parts except the jars and then just started gluing everything together. I glued the little miniature candle holders upside down on the lids to look like knobs and then I glued the jars on the candle sticks. I used E6000 so they would stay glued. After they were dry I just added some Halloween candy. Perfect. You could customize these to any holiday by using different color paints or changing up the handles for different types of holiday objects. Here are the three I made. The kids loved them. I should have added Miss A's rat crawling around among them - how appropriate for Halloween. 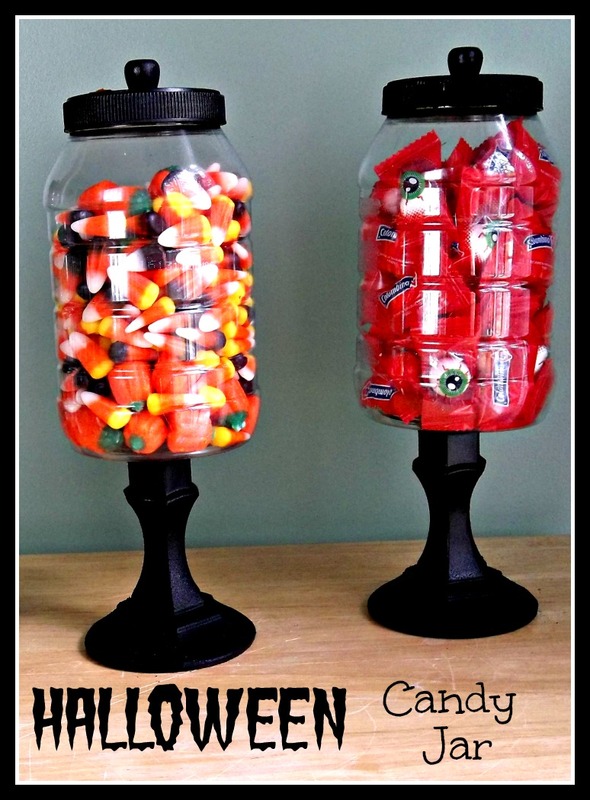 Such a simple and budget friendly way to store that candy this holiday. Do you do a lot of decorating for Halloween or are you like me and just keep the fall decor up? I love to hear from you so tell me about it in the comments below. I answer all comments with email. I will be linking up to the parties listed on the Where I Party page. Please visit them and check out all the great crafts, recipes, and DIY projects there. I love this idea Cathy! Very creative! I love this project!! 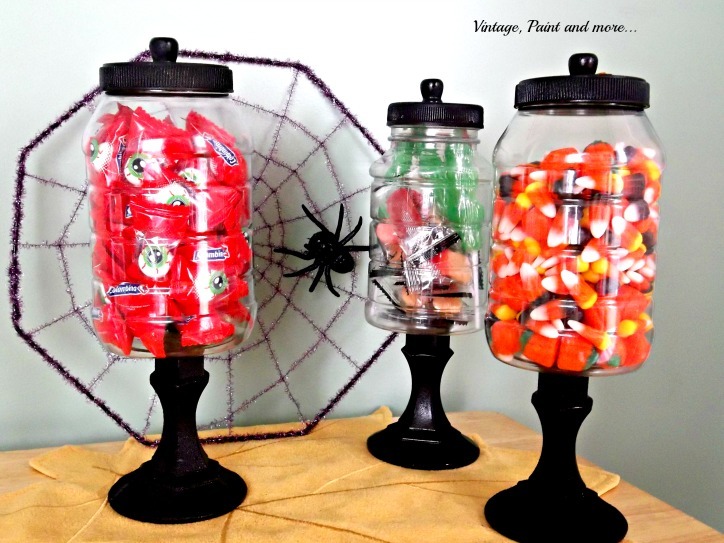 I do a Candy Bar in my Kitchen for every Holiday using apothecary jars but i really like this. I am thinking of doing the same but instead of black using red to match my Kitchen!! Thanks so much for sharing!! What an Inspiration!! Thanks also for taking the time to drop by and leave such nice comments! !